PEPLUM. As much as I love colorful looks, a simple black and white outfit never fails! This peplum jacket was one of the pieces I chose for the “How to wear peplums” guide I did for Asos and I’ve already been getting so much wear out of it. It’s super easy to style and looks good with pretty much anything, perfect for those days when you’re in a rush and have “nothing to wear”! ASOS peplum jacket (here). ZARA jeans. CÉLINE sunglasses. ZARA clutch. MICHAEL KORS watch (similar ones here & here). CHIARA FERRAGNI shoes (here). This entry was posted in Outfit and tagged asos, asos peplum jacket, how to wear peplums, peplum jacket, peplums by Carolina Engman. Bookmark the permalink. Love it! It looks simple, but every piece has it own detail that makes this outfit so special. Great look! black and white is always a classy and stylish combination!!!! but what i like the most is the brown shoes!! Gorgeous! I love your leopard clutch and your heels! Such a chic outfit. love ur heels and the leopard clutch.. Very pretty I love the jacket and the pumps very creative ! You look amazing! I love the clutch specially! you look amazing here,great pics! Cute jacket! It doesn’t look like much on the ASOS website, but I love the way you’ve styled it here. Brava! Love your outfit! Everything is just to die for. love that you wear heels from Chiara ! and ofcourse the jacket ! Just when I thought I’d never give in to this trend, you’ve changed my mind! This jacket is too cute!! love the peplum jacket and love the heels!! These are great shots. I really like those heels too! That is a really great piece! Love the way you styled it! Your jacket is wonderful and you look so elegant and sophisticated! Chic chic!! One can never go wrong with black and white!! Lovely shoes dear, I know the feeling a huge closet that you can’t close and nothing to wear. love the peplum trend ! I love peplum and I always swear by it, so I adore this look. The jacket is not over-drawn, but very subtle and exciting at the same time. Pretty! Who said “don’t mix brown and black”?! It looks great together. And I love this jacket! More pictures of the jacket – it looks so beautiful but I can’t see it right. Oh my, I love your heels! that jacket is SOOo chic! definitely my favorite look from the series, you just look so sleek and perfect in that way that only you can! Love this look!! So effortlessly chic. gorgeous look !! a lot of style with almost anything ! I love everything about this outfit! The jacket is gorgeous. I love peplum skirts, tops, jackets – everything! This jacket is just too adorable! Que bonita queda la chaqueta en plan peplum! The peplum jacket paired with the zip front, coated denim makes such a super cool look. Fabulous as always! 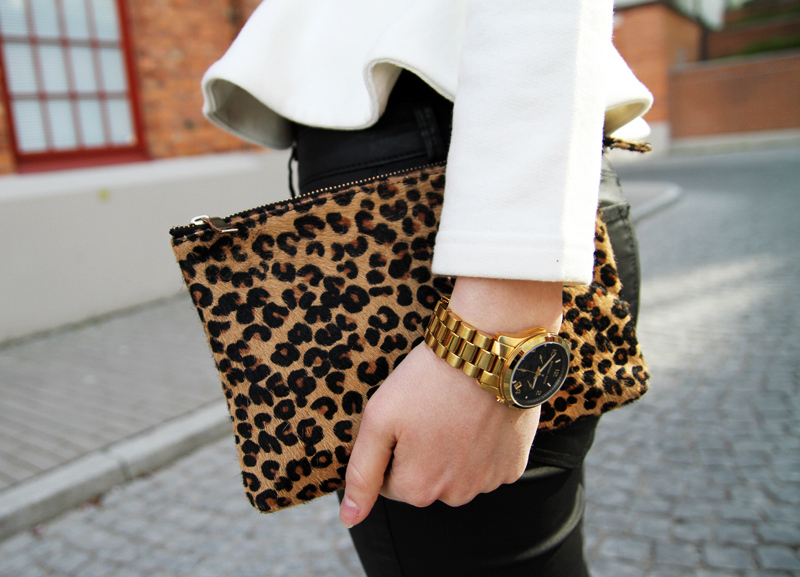 Great outfit, the clutch is so fierce! Cute outfit. I love the little handbag. Love this outfit, awesome shoes! I’m loving your peplum choices, this one is incredibly sophisticated! It can be very simple to style but only you know how to make it look amazing! it’s a very very nice outfit! Look my blog, it s gorgeous! I love this outfit – beautiful jacket! love the jacket especially with the brown in the clutch and shoes! Super chic yet simple look :) love it! Amazing shoes! i Love this outfit! I’m loving peplum more and more each day but I haven’t challenged myself to try it out yet. I’m afraid that it will emphasize my hips a bit too much. Although I’m not a fat girl, I have a slightly large bone structure when it comes to hips. Too bad the white isn’t on sale.. You look lovely. Love this black and white look. Great peplum jacket. YOUR LOOK IS REALLY FANTASTIC I FOLLOW YOU! I’m drooling over here. Everything about that outfit is just spot on fierce and wonderful. love the jacket and your heels! You look amazing! I really love the look! Your jacket looks amaze! Perfect shape. Amazing jacket and beautiful heels! great post ^ fabolous outfit! love it. altough im not a big fun of the new peplum trend, this jacket is amazing! I love how peplums have worked their way into almost every item in ones wardrobe. This jacket is amazing! God, I absolytely love the peplum items!! This jacket is so gorgeous, love the shoes and watch to!! I love it, it’s like a subtle peplum. You look amazing! Love the cut of the jacket! I can’t express how much I love the jacket. How come there’s not one in white in asos?? Wonderful outfit, black and white always go together it will never fail, the bag and the shoes match the outfit perfectly. Gorgeous look! I’m in love with anything peplum lately! I love this particular peplum jacket! I bought one from H&M but it is strictly for winter! I love those shoes as well, definitely will have to check out Chiara’s shoe line! I love how you put this outfit together. The detail on the heels is particularly stunning! loving this look! especially the peplum! I used to be more of a peasant blouse flowy kind of person until I met peplum. There were these two tops I simply could not love any more and they were both peplum. I bought one of them even though it was 90$. Your peplum top is really elegant and sophisticated, it goes really well with everything else in your outfit. I also really love your shoes. Love the Zara clutch I was actually just about to purchase it but ended up putting it back, now i want it again! OMG that watch is AMAZING!!!! Where did you get it? I’ve been looking for that same one. WOOOW! you look so stylish and awesome! where can i buy the sunglasses? You created the perfect combination of sweet rocker with this look! Absolutely stunning! On our site you can find original pieces as unique as each one of us! These handmade clothes are made exclusively for you. You can find a combination between fashion and artistic textures in these one-of-a-kind pieces. LOVE the jacket! I’m sad that ASOS doesn’t offer it in white anymore :( Love the way you styled it! Ok those are KILLER heels!! I’m so in love with this peplum trend! So feminine and pretty, just like you! I’ve been hesitant to try the peplum trend, but this jacket is a perfect way to do it! Check this out! They have lots of sunglasses: http://www.vusionglasses.com that can be ordered online. Adore this outfit. Those heels and jeans are insane!! One of my most fav blogs online, keep up the great work.